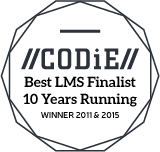 Edvance360 is proud to be a 2018 SIIA CODiE Finalist for 10 years running. Learn more. According to Educause badges are: “awarded by institutions, organizations, groups, or individuals, badges signify accomplishments such as completion of a project, mastery of a skill, or marks of experience.” Award users with badges and leverage the gamification of education. Watch the video below to learn more about badges in Edvance360. Learn more about Edvance360’s integration with Credly™ for the awarding of badges to motivate your learners. Read about our badge integration in Campus Technology. Are You Using Gaming for Learning? Badges: A Solution to Our Teacher Evaluation Disaster? Why Get a Pricey Diploma When a Bleepin’ Badge Will Do?